Fancy doing something a bit different with food today, other than making something yummy to eat? Then why not make something from food that smells yummy, but that also looks good hanging up as a Christmas decoration instead? There are loads of Christmas food crafts for kids to do, but we’ve just settled on four favourites. 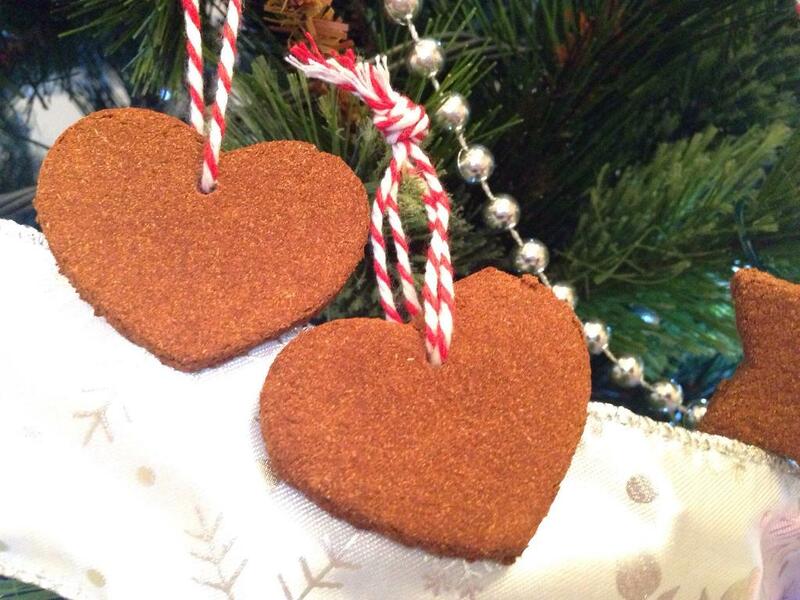 We know you’re busy, and besides, there are loads of yummy edible gifts you can be making too. 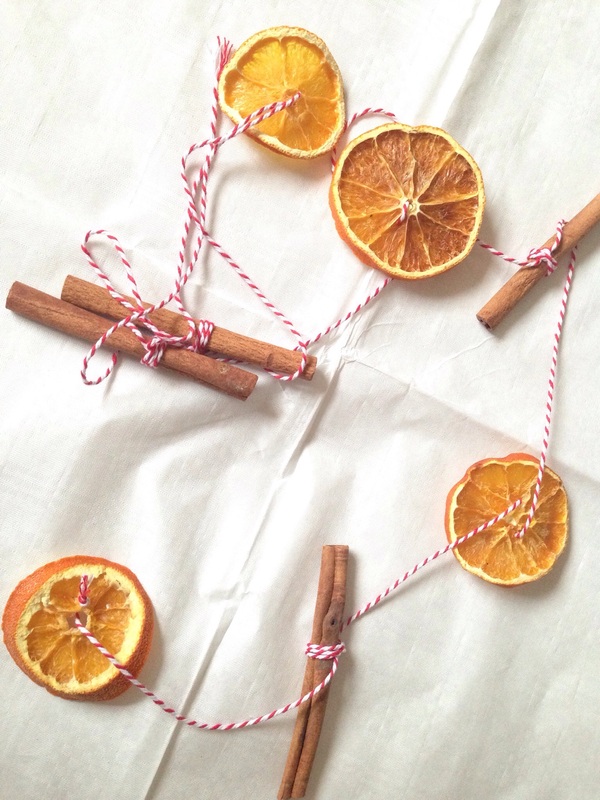 You don’t need anything fancy to take part in these food crafts; if you have oranges, apples, cloves, cinnamon, and popcorn then you can make some fabulous Christmassy stuff. Of course, if you have some nice ribbon, raffia, or bakers twine around too, then that all helps to make crafts look extra pretty. Although these crafts look and smell yummy, and are made from all things edible, I would NOT recommend eating them. Want to jazz up your bedroom door? 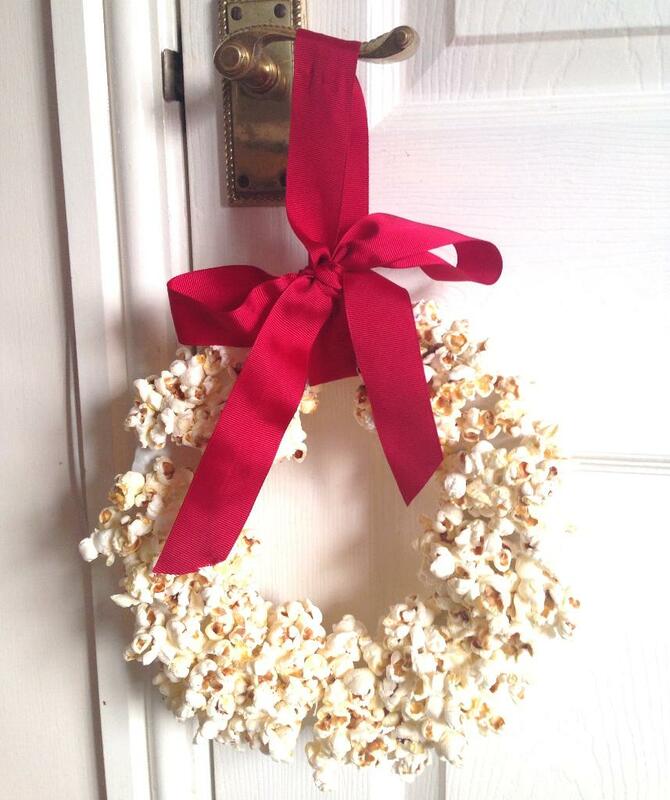 A Popcorn paper plate wreath is the perfect answer, although it does take a little patience. 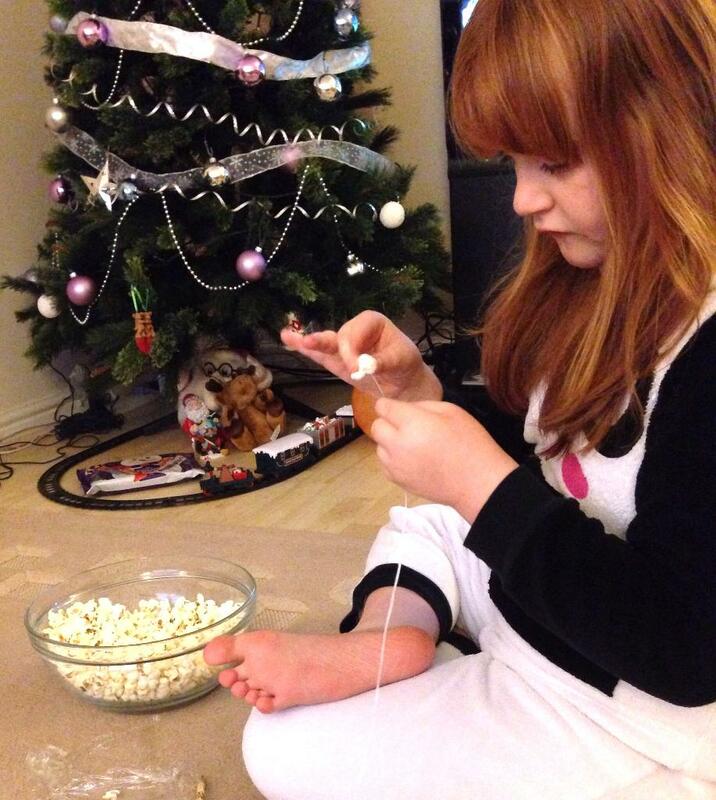 I recommend getting a grown-up to do their fair share of threading popcorn, and maybe completing it over a few sessions. Even a small paper plate takes more than an hour to complete, so it’s best to do it in stages. 1. 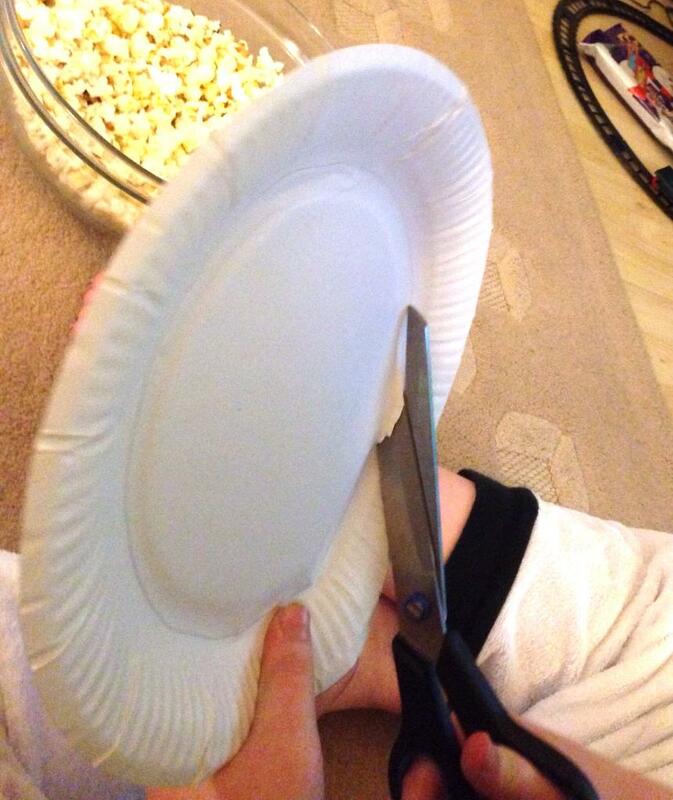 Cut the middle section from a paper plate so you have a ring shape. 2. Double thread and knot your thread or floss. Push the needle into somewhere on the plate and pull through until the knot stops you. Start threading popcorn. 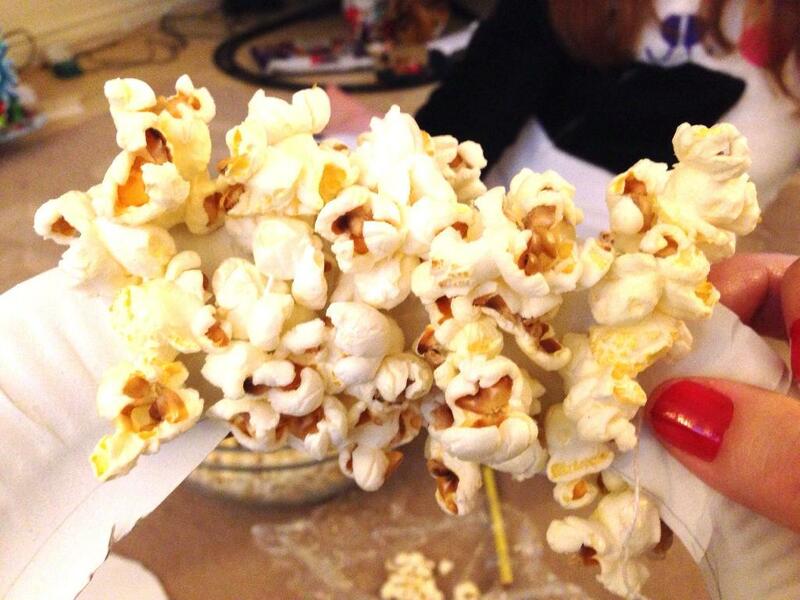 Wind your popcorn garland around the plate as you go. 3. When you get to the end of the thread, tie it off with a knot. Thread some more thread and push the needle through, close to where you just finished. Start threading the popcorn and winding around the plate again. 4. Keep going until you’ve covered the paper plate. Tie off with a knot. 5. Hang your paper plate using some pretty ribbon. 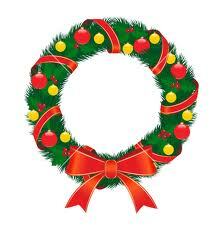 The word wreath comes from the Middle English word “wrethe,” which means a twisted band of leaves or flowers in a garland. Some say that we hang wreaths at Christmas as the ancient Romans celebrated New Year by wishing each other “good health” by exchanging branches of evergreens. However, I think this theory makes more sense: In Germany, when they couldn’t fit a full Christmas tree into their house, they would trim the tree and turn these Christmas tree branches into a ring and hang them on their front door as a decoration. Much better than throwing away the unused branches. Orange pomanders are really fun and easy to make, but the cloves can be a bit ouchy on your fingers after a while, so make sure you follow our method to keep your fingers from getting sore. The best bit about making these pomanders is that you can choose your own design! You can just do a random all-over type of design, choose a simple shape like a heart, or be really adventurous and write out your name or initials. 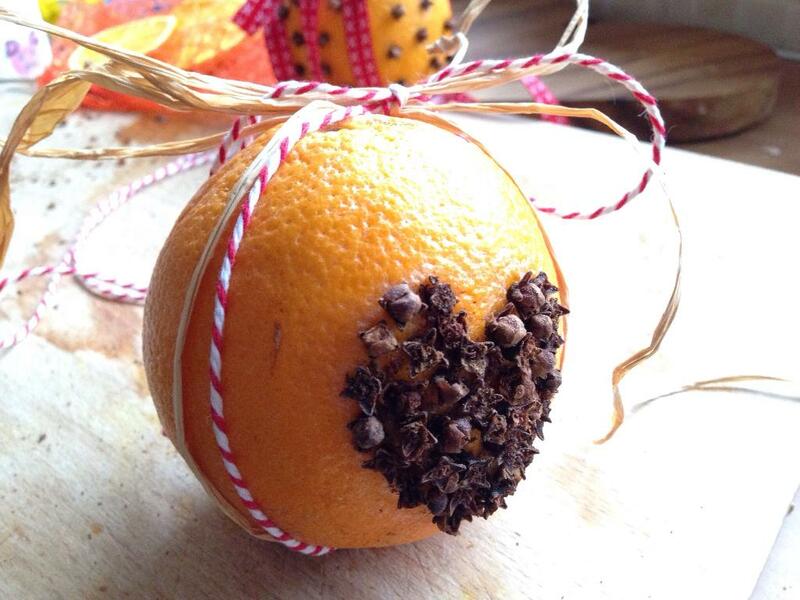 You can also try doing the same thing with tangerines or clementines, and use each one for a letter of your name. So a whole row of little oranges spells out your name! 1. If you’re going for a particular design then draw it onto your orange. 2. 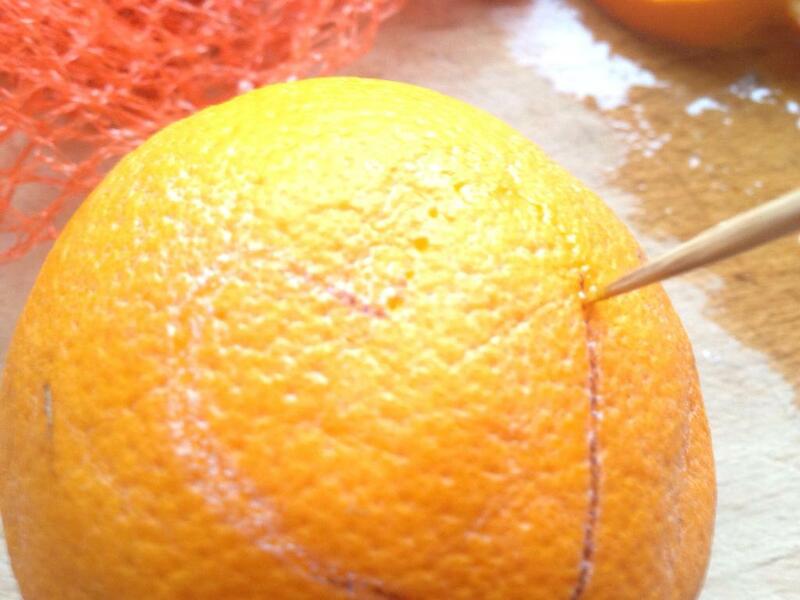 Use a skewer to press a small hole into the orange, either around your shape or just in a random spot. If you don’t press a hole first then the cloves are really hard to push into the orange skin. 3. Keep moving around the orange, making a hole with the skewer before you push the clove in each time. 4. When you’re done, tie a ribbon around the orange. Make sure you tie it securely at the top with a double knot, and then tie it into a pretty bow. Use the bow ends to make a hanging loop. TIP: Once you’ve tied the ribbon, if the cloves are causing the ribbon to stand up or look bumpy, then remove the cloves that are under the ribbon so it lies flat. 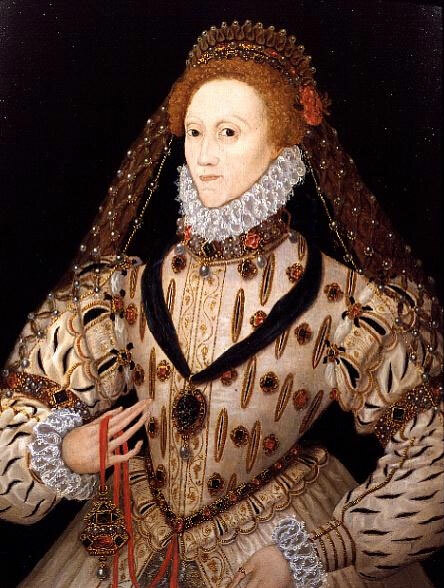 Elizabeth I with a pomander around her waist. Hers is gilded and studded with jewels! Pomanders were popular in the Middle Ages in Britain, as the people in those days didn’t use to wash very often, or have proper toilets, so everywhere was a bit smelly. People would carry pomanders around so they had something nice to smell, instead of all the yucky smells around them. They would often wear them around their neck or waist. By the 18th century, the most popular pomanders were oranges studded with cloves (like the ones we’ve made here). They became so popular, that people would make them as gifts to give at Christmas and New Year. These ornaments are so much fun, as you can cut them into any shape you want, and they give off the most delicious smell as they hang happily on your tree. You also only need two ingredients to make them. It can get a little messy as you make them, but it’s not sticky, just some nice messy fun! 1. Put your applesauce and cinnamon into a bowl. Work it together with a spoon, and then get your hands in the bowl and keep mixing it until you have a dough. 2. Put the dough onto some greaseproof paper, and put another sheet of paper over the top. 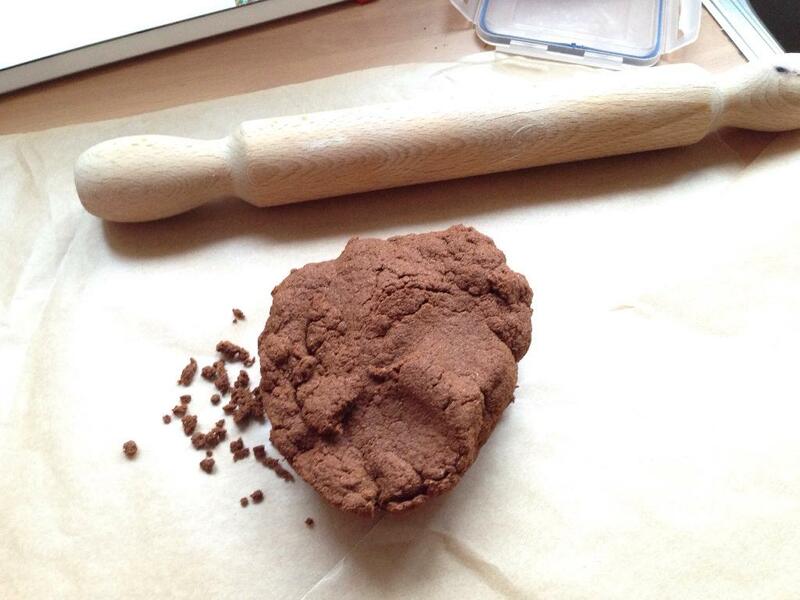 Use a rolling pin to roll the dough between the two sheets, until it’s about 5mm (1/4 inch) thick. 3. 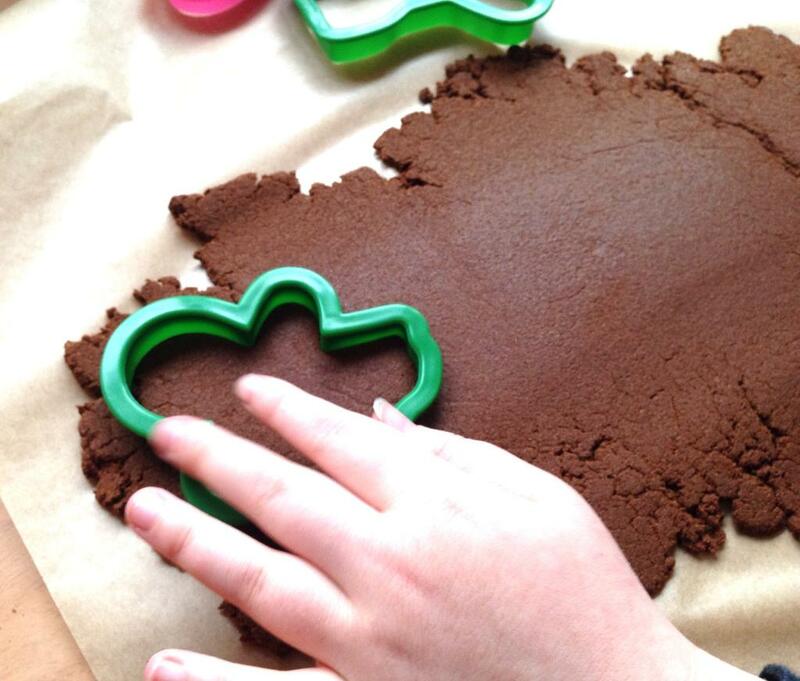 Cut out shapes and put them on a baking tray that’s lined with more greaseproof or baking parchment. Re-roll your dough as neccessary until you have used it all. 4. Press a skewer or pencil into the top of each shape to make a hole that you can thread ribbon through later on. 5. 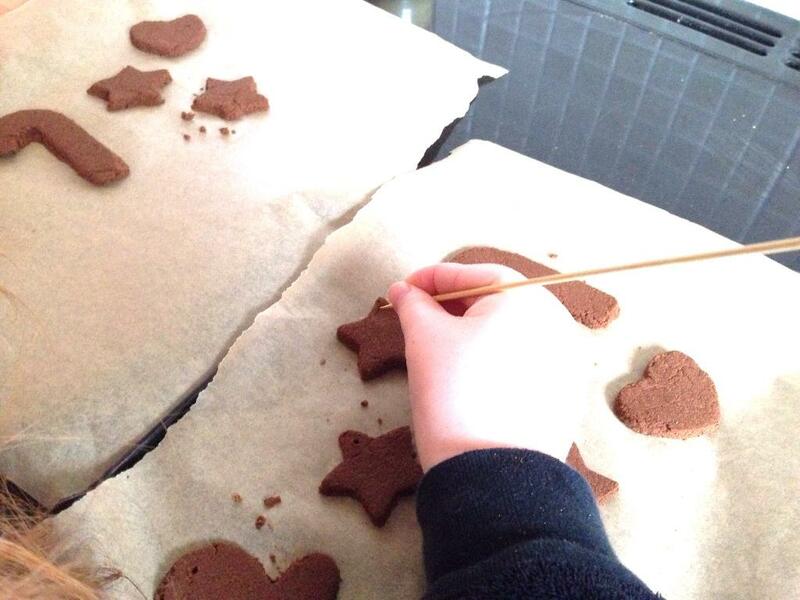 Bake your shapes for 2-2 1/2 hours on a low heat–around 100c, 200f. * Run Out of Applesauce or Cinnamon? If your mix is too dry but you’ve run out of applesauce, you can add some fruit juice to the mix. 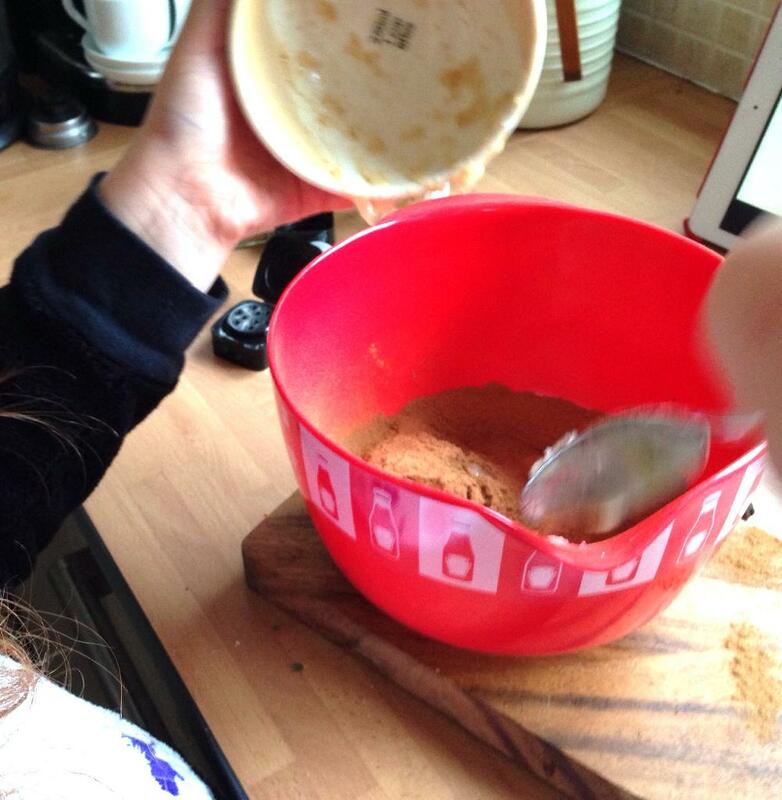 If your mix is too wet, but you’ve run out of cinnamon, you can add ground ginger or cloves, or even a spot of flour. 5. Thread some twine or ribbon through the hole, tie in a knot, and hang on the tree. The aroma is gorgeous! 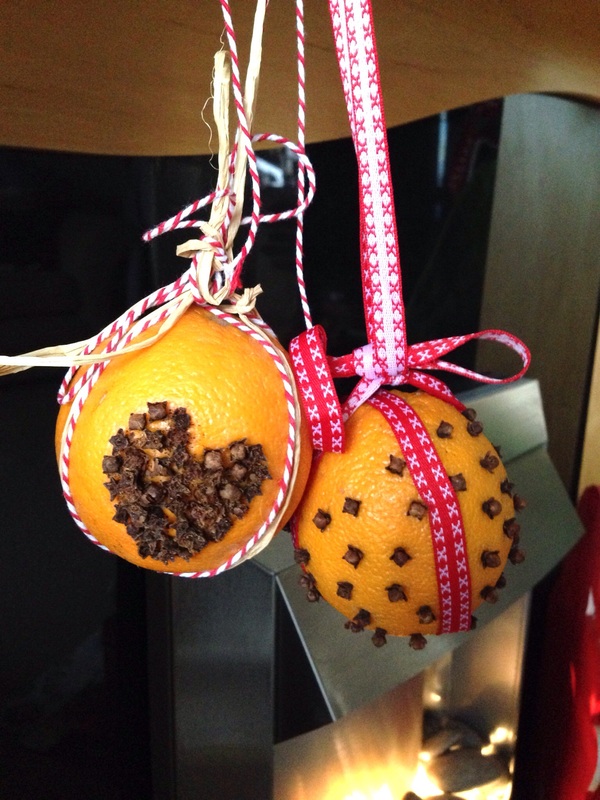 We’ve used some bakers twine and threaded them through the orange slices with some cinammon. 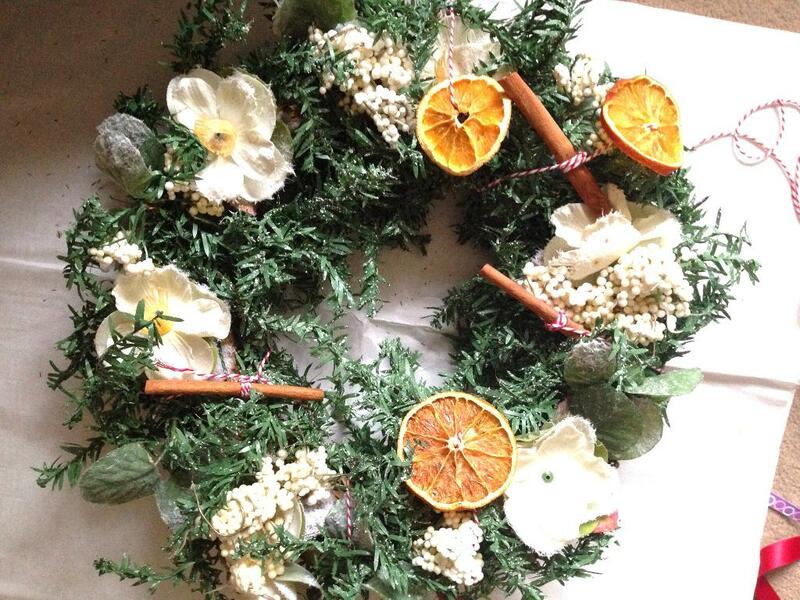 You can then wrap this round a wreath you already have, or hang them above the fireplace. You can also use dried orange slices as a pretty decoration when you are wrapping presents, to make them look more Christmassy–and make your presents smell nice too. Or, you can just throw them in a bowl with some pine cones, cinnamon sticks, star anise, trimmed bits from the Christmas tree, spare baubles… whatever you have to hand that looks pretty, and this makes a nice smelling pot pourri or table centrepiece. 1. 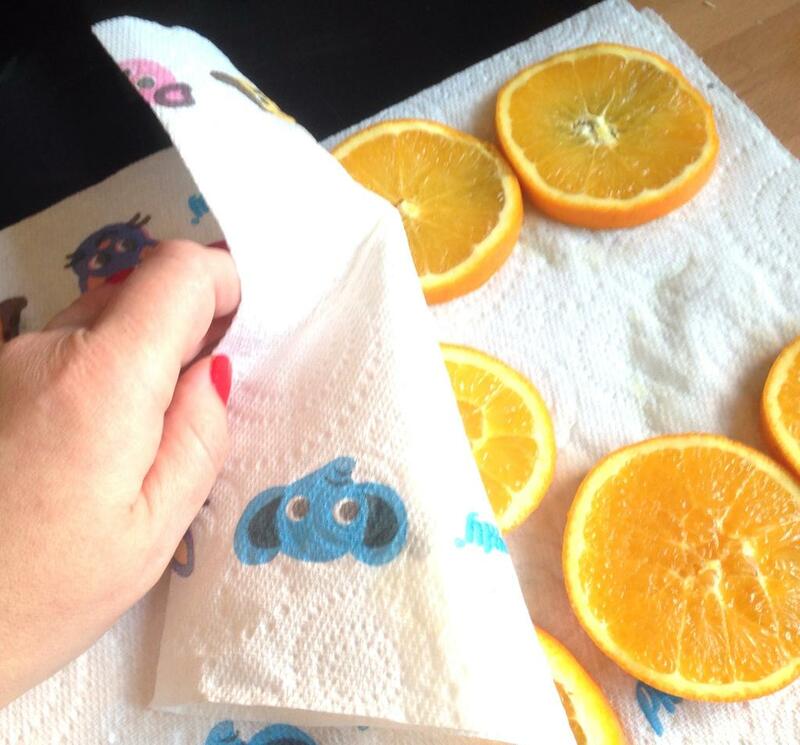 Grown-ups should cut the oranges into slices of about 5mm (1/4 inch). Put them on some kitchen towel and pat them to dry them out as much as you can. 2. Put the slices onto a metal rack or directly onto the oven shelf–it helps if you get as much air circulating as possible. Bake in a cool oven (about 100c/200f), for around 2 hours or more if you need to. They’re done when the flesh looks translucent. OR, you can dry them out on a radiator for a few days. 3. Now you can use them to decorate in any of the three ways detailed above (wreath, present decorating, pot pourri), or in any other way you choose. 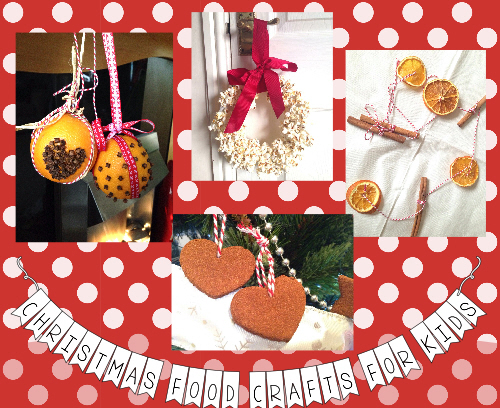 Or why not take a look at our roundup of Christmas gifts to make.